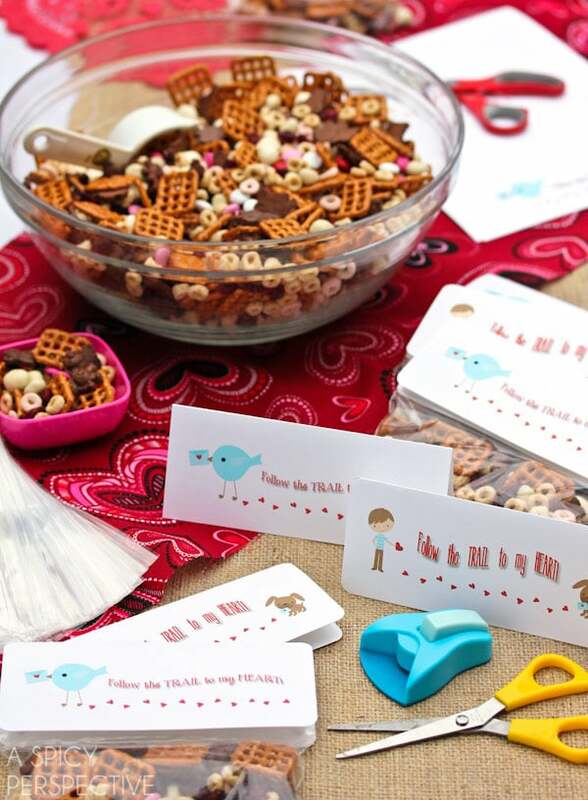 Homemade Trail Mix Valentine Snack + Printable Tags. No cooking or baking today; just a simple dump and stir homemade trail mix recipe that makes an exciting Valentine snack to send to school. 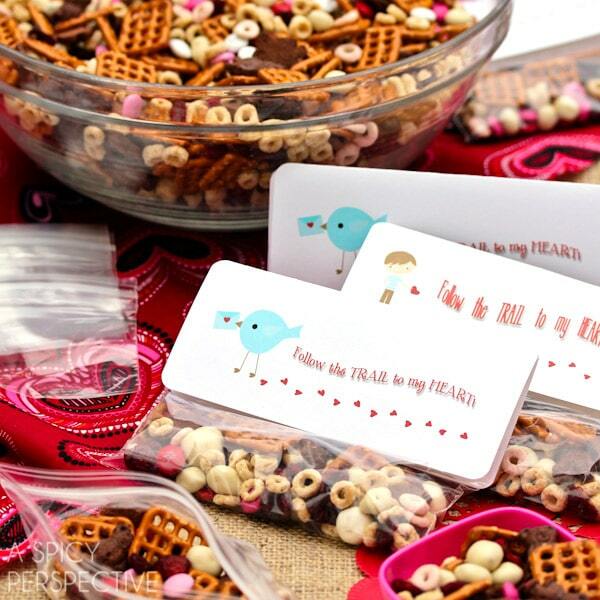 This Valentine snack is a great filler for goodie bags. Mix the homemade trail mix, scoop into snack-sized bags, then add a fun tag. Generally, I’m NOT very crafty. The craftiest I get is making paper flowers for cupcake toppers or trying to paint fondant gnomes. So if I can create Valentine cards with my kids, YOU can make Valentine cards too! For these sweet Valentine bag tags, I used clip art from Cocoa Mint, and online store that offers cute clean graphics and printable invitations, party supplies, and digital backgrounds. The clip art allowed me to FEEL crafty, when really all I did was cut and paste …with my mouse. Thanks Cocoa Mint! You can make your own, or use mine. 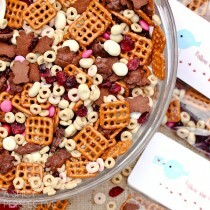 Either way, this Homemade Trail Mix Valentine Snack will be the hit of the party. Cut each sheet in half, then trim approximately 3/4 inch off each side to match the width of the snack bags. Homemade Trail Mix Valentine Snack makes a great Saturday project. The kids literally did everything from mixing to glue-dotting. They are SO excited to share these original Valentines with their friends. This homemade trail mix has all the right ingredients for pure Valentine joy. I left out the nuts in traditional trail mix to keep it safe for the classroom, but the pretzels offer a salty bite to balance the sweetness. This is good stuff! Dump all the ingredients in a large bowl and mix. Use a 1/2 cup scoop to pour into snack-size zip bags. Cute idea but when I used the template I was not able to simply fold the paper in half and cut. It required a lot more cutting to get the right size. Maybe the template is off slightly, the images did not seem to be centered on the top and bottom of the paper. Hi Amy! Hmmm… let me take a look. I am having the same template difficulty as Amy. Also, I would like to insert a girl image to send the treats to my daughter’s class. May you please send me your original template? Thank you so much for sharing your idea and template. My daughter is very excited to take these treats to school! LOVE this idea. My mind is racing with different things you could put in the trail mix. The labels are extremely adorable and I can’t wait to use them. Thanks for the share. times previous to I could get iit to load properly. high-quality score if adss and marketing with Adwords. Hi! I just made this cute Valentine trail mix and it’s adorable! 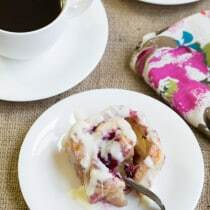 Thanks for the free printable and the recipe. I had to tweak a few things since I couldn’t find a couple exact items in my grocery, but close enough. So fun! Just wanted to say THANKS! These are lovely and the snack mix is awesome, but the tags are such a waste of paper, I cut off more than I used. Both are supposed to be on one sheet–not sure what happened! I’ll see if I can change it back for future users. Can I ask how many snack bags you were able to make with these ingredients? Also, what program did you use to make those adorable tags? 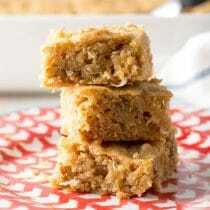 Hi Victoria, about 34 1/2 cup servings. Honestly, I think I just pulled the graphics into a word doc! Thank you for this great idea! We will do this for the Headstart classes! 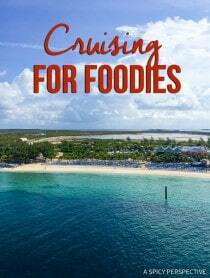 Just thought I’d let you know I included a link to your trail mix on my personal blog. Such a cute idea! Thanks for the post! Hi! Can you email the printable tag to me? For some reason I’m unable to open the link you post. Thanks. Have to comment sorry. I came across this on Pinterest. Want to mention that while you “left out” the nuts to make this snack “safe” for the classroom, its actually NOT (if targeting nut allergies). Several of the ingredients are EXTREMELY high risk for an allergic reaction for anyone with a peanut / tree nut allergy (may actually contain the allergens). Sorry ….. but otherwise its very cute. Agree. Many of these items were made in a facility that also makes things with Nuts; M&M’s & yogurt covered raisins being the big ones. Are these free printables still available ? what an adorable idea. 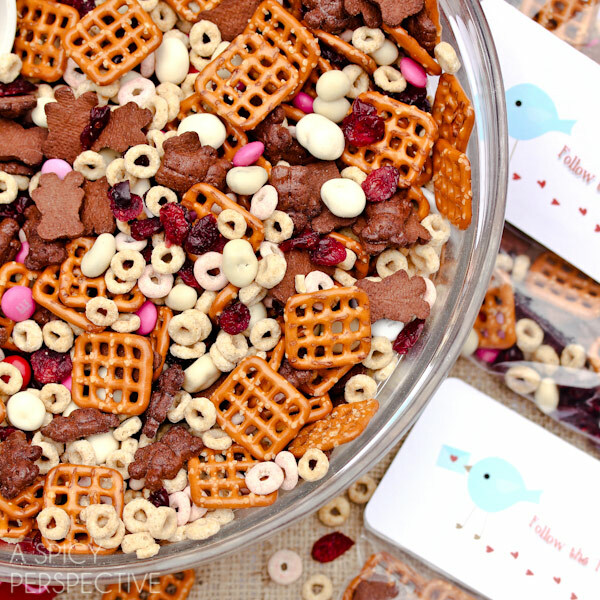 I am going to make this trail mix to send with my son on Valentine’s Day. Or I’ll have it here waiting for him when he comes home (at 16 it might embarrass him at school). 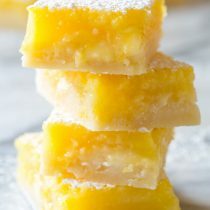 Looks so delicious and fun. My daughters and I are going to do this for Valentine’s Day! We even found heart shaped Cherrios! I found the girl clip art on Cocoa Mint, but am embarrassed to say that I don’t know how to change out the boy for the girl….any help would be greatly appreciated! Thanks again!!!! Hi, would you be able to send me the original as well? I would greatly appreciate it! thanks! Can I get the original? I would like to change the boy out for a girl. Please let me know if this can be done. Very cute idea, and a nice activity to complete with children. These are adorably cute and innovative! Well done. such a cute idea. thx, Spicy! Super cute idea and a healthier sweet treat for kids on Valentines Day. That is SO ridiculously cute! this is so cute, I’m sending it to my sister-in-law for her girls to use! Very cute idea. Just passed this along to some of the mom’s in my office :)! What a cute idea!!! I don’t have kids, but I have a niece and a plethora of nephews. I will pass this along as I think this would be a cute hand out for the kids in their classes. My kids would love to find a bag of this trail mix in their lunch boxes! I am decidedly uncrafty, too, but am now wondering if I could pull off these cute tags. Thanks for the great idea! Very, very cute idea. I can see this winning may hearts! Argh! My hands don’t work properly in this cold weather. That should obviously read ‘many hearts’! This is such a clever idea Sommer! It looks so fun especially with all your personal touches. I am still saturated on sweets from the holiday so this would be a great solution for Valentine’s Day snacks. Will have to think of how to switch it up to be gluten free. Oh my! This looks like such a cute idea, Sommer! How cute those bags and tags are. They would be a hit at my daughter’s dance studio. Come visit. We have a fat free sweet potato souffle and a great quinoa recipe this week. This is sooo adorable! I love it, I think all of the ingredeients in the mix are great too. Awesome idea! This is so fun. I love the festive M&M’s. Perfect gift! What a cute idea, Sommer! LOVE! 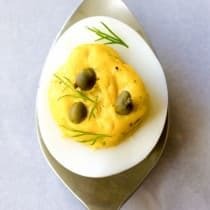 Cute and tasty idea! So much better than all of the candy options I’m seeing at the stores. Wow, I totally forgot about Teddy Grahams. I LOVE those things! Adorable. I love the line “follow the trail to my heart” – so very clever! Love the little packs all made up with labels like that. So cute! Super cute idea Sommer! I’m sure these would be a hit at any kid’s Valentine’s Day party. SO cute and yummy! You are MUCH craftier than I am, but I think I could do this! SO adorable!! I’m not crafty at all either but these are too cute to pass up. 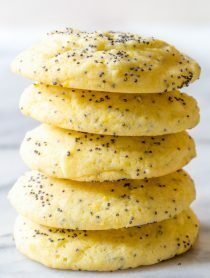 Our school won’t let the kids exchange any type of food with other kids so I may have to make these a neighborhood treat! Usually I’m pretty “eh” about trail mix but this is one I would definitely be eating by the handfuls! Aww love those tags! This sounds awesome.